Methods: Specifically, we infer a prostate cancer Gene Regulatory Network (GRN) from a large-scale gene expression data set of 333 patient RNA-seq profiles obtained from The Cancer Genome Atlas (TCGA) database. 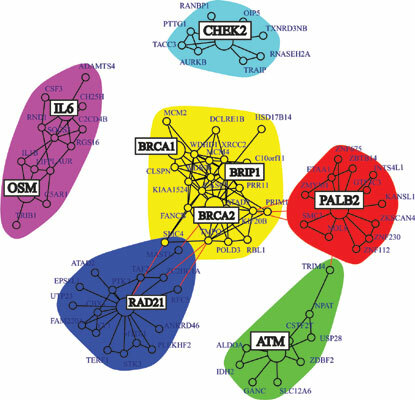 Results: We analyze the functional components of the inferred network by extracting subnetworks based on biological process information and interpret the role of known cancer genes within each process. Furthermore, we investigate the local landscape of prostate cancer genes and discuss pathological associations that may be relevant in the development of new targeted cancer therapies. Conclusion: Our network-based analysis provides a practical systems biology approach to reveal the collective gene-interactions of prostate cancer. This allows a close interpretation of biological activity in terms of the hallmarks of cancer. Keywords: Gene regulatory network, Prostate cancer, Genomics, Systems biology, Network inference, Precision medicine, Data science. Keywords:Gene regulatory network, Prostate cancer, Genomics, Systems biology, Network inference, Precision medicine, Data science. Abstract:Background: Cancer is a complex disease with a lucid etiology and in understanding the causation, we need to appreciate this complexity.